Die complexity and size, and the quest for prolonged life of die components, are some of the issues keeping the toolroom at Wiegel Tool Works, Wood Dale, IL, on its toes these days. All the while, the company’s pressroom continues to require its dies to run at faster speeds and provide a higher degree of accuracy. With the acquisition in 2006 of a new 450-ton variable-stroke press—with a 120-in.-long bed—the firm now finds itself quoting numerous projects requiring more complex and larger dies. Wiegel operates this EDM production cell that comprises two Mitsubishi EDM machines (an FA10P and FA20P) and a System 3R WorkMaster robot. The added flexibility from the automation allows the firm to perform on-demand machining of replacement tools to minimize downtime of its own stamping presses and those of its customers. Wiegel specializes in stamping preplated copper-alloy electrical-circuit components such as fuse relays, with volumes as high as 4 to 5 million per year. The dies it designs and builds—for itself and for its key customers—now typically comprise as many as 20 progressive stations and are tasked with meeting part dimensional tolerances as tight as ±0.005 in. Wiegel is fully committed to designing, building and maintaining all of its tooling inhouse, and invests as needed in new technology to ensure it meets the needs of its customers—internal and external. Among the equipment in its tooling department are vertical and horizontal machining centers. But what earns the most applause is a climate-controlled wire-EDM department boasting eight machines, including two working in a robot-tended workcell. EDM tolerances on die inserts are measured down to ±0.0001 in. Wiegel works out of a 68,000-sq.-ft. facility, including a recently built 20,000-sq.-ft. addition. It also, in September 2011, acquired a nearby 25,000 sq.-ft. building to house shipping and receiving, as well as warehousing of finished goods and raw materials. The acquisition allowed the company to increase manufacturing capacity in its main building, evidenced with the addition, in December 2011, of a new state-of-the-art high-speed stamping line. The new line features a 180-ton variable-stroke Minster press and a high-end leveler-straightener. The straightener powers 13 rolls and backup rollers, designed to relieve stresses from higher-strength steels. More capacity means more dies. And, when making large capital investments such as a new press line, ensuring optimum press uptime is critical. As an example, toolroom manager Rich Wiess describes a die that the Wiegel toolroom built in 2008 for another stamper/customer. The 90-in.-long die comprises 18 stations and runs plated copper-alloy components for electrical circuit boards that go into automotive transmissions. When the customer began to struggle with quality and on-time delivery, Wiegel took the die back, added some proprietary technology and saw immediate returns —uptime was increased by 35 to 40 percent, due to improvements such as changing the tool coating and engineering new features to better contain slugs. Wiess and his crew boast that “there’s nothing we can’t make here,” noting most importantly its investments made a few years ago in hard milling. Before hard milling, the toolroom would machine die steels soft and send components out for heattreat. “Again, our biggest cost here is downtime in the pressroom,” Wiegel reiterates, noting that the toolroom doesn’t generate much profit, if any. But, its level of performance sure can make a difference in pressroom productivity and profitability. Inserts that might have once taken two or three days to pre-machine, heattreat and wire-EDM now are hard-milled, tapped and wire-cut in an hour or two. The Wiegel toolroom performs hard milling primarily for new dies—punch plates and strippers, for example. 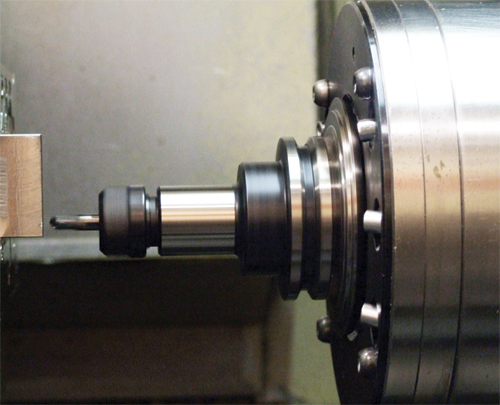 Describing the benefits of hard milling, Wiess points to the process of counterboring for pilot holes as an example. The Wiegel toolroom performs hard milling primarily for new dies—punch plates and strippers, for example. Inserts that might have once taken two or three days to premachine, heattreat and wire-EDM now are hard-milled, tapped and wire-cut in an hour or two. 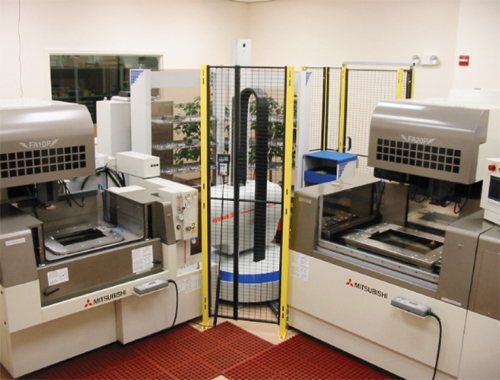 The automated cell comprises two Mitsubishi EDM machines (an FA10P and FA20P) and a System 3R WorkMaster robot. Lead-time reduction has many faces at Wiegel, beginning with an investment made in 2005 into new 3D solid-modeling die-design and simulation software—Siemens’ NX. It also has standardized on die-plate thicknesses and tool steels. Wiegel was, back in 2003, a beta site for NX and Siemens’ optional Progressive Die Wizard module. The module significantly reduces modeling time from hours to minutes, says Wiegel, and also displays strip-layout simulations for immediate feedback when making design and process changes. Design time, he says, was reduced by about one-third when the software became fully functional, and his pending investment in waterjet cutting is expected to reduce lead times by another 15 to 20 percent. Not only will faster turnaround of new dies help its own pressroom, but Aaron Wiegel finds that customers are getting used to paying a premium for speed. He counts about 20 key stamping customers that source his company for tooling. See also: MC Machinery Systems, Siemens Industry, Inc.